THE air is full of volatile chemicals ranging from fragrances to toxins like carbon monoxide. A robot that could sniff out the toxin would be useful in mines and industrial units. Scientists at the University of Tokyo have developed a sniffer robot using frog eggs. 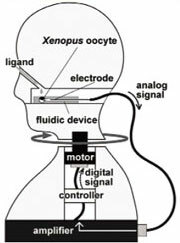 The researchers used oocytes, or immature egg cells, of the African Clawed Frog (Xenopus laevis) to build the highly sensitive and selective biohybrid odorant sensor. The oocytes were injected with DNA of fruit flies, silk moths and diamond back moths, which stimulated the eggs to produce the olfactory sensors of these insects. “These oocytes have previously not been considered for application as sensors,” said Shoji Takeuchi, the lead researcher. The sensor can detect small amounts of the chemical. The genetically modified eggs were placed between a pair of electrodes to form a detector, which measures the current created when the receptors on the egg bind with the odour molecules. The scientists then installed the sensor device in the head of a robot mannequin. The electric current generated could move the robot’s head back and forth. The authors concluded in their paper published in the August issue of the journal PNAS that owing to their portability and high sensitivity the robots can be used in various industrial operations to prevent major accidents. “The development of a portable cell-based sensor with high specificity and selectivity will essentially change the present scenario of environment management,” said Yutaka Mizuta from Kyushu University, Japan, who had described a similar immunosensor in 2008. Mizuta had developed an ethylene- based immunosensor could identify TNT, one of the most commonly used explosives.